 REPLACE YOUR PHYSICAL DICE: Replace your boring physical dice with a fun-filled Dice Button! This Dice Button will make your favorite board games even more fun. Excellent alternative for all types of board games. 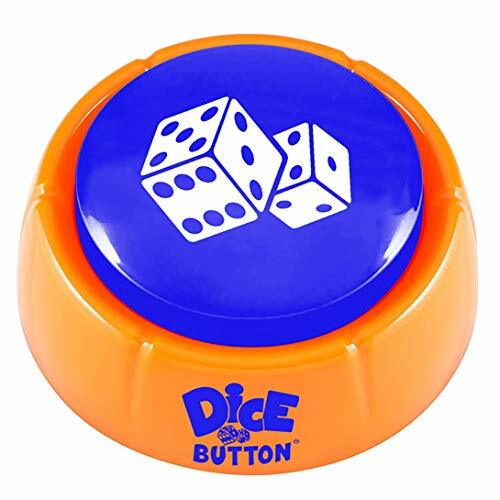 It contains realistic dice sounds as if you are actually shaking the dice and rolling them onto the table with Random Numbers 1-6 in Audio.  AVOID LOSING YOUR DICE: Are you tired of losing your dice after every single game you play? Dice Button is the perfect solution! It is easy and fun to use. No more tossing your dice out of the Board Game and them being sent rolling under a table just for you to not ever find them again.  SAFE FOR CHILDREN AND PETS: The regular dice are small and dangerous to children and pets. With Dice Button you completely avoid that problem due to it being Safe for small players and Pets. Dice for Kids.  MORE EXCITING TO PLAY: A simple tap on the top of the button and you will listen to the sound of the dice rolling. You will then hear a random number from 1 to 6. Board games are now even easier and more exciting to play! Enjoy playing your favorite board games with the Dice Button. Have an unforgettable time with your friends and family.  FOR ALL OCCASIONS: You can use it with any game on the market that uses 1 or 2 dice . For games with two dice, the player must press the button 2 times. Perfect for indoor or outdoor events such as parties, BBQs, tailgating, group events, camping and much more! Novelty Game with Audio! Great family fun!